In this letter, REDRESS and five other human rights organisations urge Thorbjørn Jagland, Secretary General of the Council of Europe, to extend the Article 52 inquiry into member states' involvement in the CIA programme of secret rendition, detention and interrogation. States were asked to provide further information to the inquiry by the end of September 2015 and the organisations are concerned that this request may now lead to a sudden conclusion of the inquiry despite a lack of accountability for governments' actions. In the letter, they also request the Secretary General to accept information from non-state sources as well as make public the outcomes of the inquiry on member states' progress at conducting effective investigations into this matter. The letter is also signed by Amnesty International, Human Rights Watch, Open Society Justice Initiative, the International Commission of Jurists and Human Rights in Practice. The Victims’ Rights Working Group – a broad coalition of NGOs and experts informally facilitated by REDRESS – made these recommendations to the 14th Assembly of States Parties that took place from 18-26 November 2015 in The Hague. This report documents the proceedings of an expert conference organised by REDRESS and the Institute for Security Studies (ISS) on 8 - 9 September 2015 in Pretoria, South Africa. This conference brought together practitioners, lawyers, prosecutors and civil society actors from a number of African countries to explore methods of strengthening victims’ participation in criminal law proceedings. The discussion was informed by the publication of REDRESS recent report on victim participation in domestic criminal proceedings in a variety of countries worldwide. On 25 November 2015, REDRESS and partner organisations made a submission to the Secretariat of the International Conference for the Great Lakes Region. The submission describes how far Uganda, Kenya and the Democratic Republic of the Congo have worked against sexual violence against women and girls and outlines areas for improvement. These three countries together with eight other African countries signed a joint declaration to prevent sexual violence, end impunity and provide support to victims (known as the Kampala Declaration). The implementation of this declaration will be reviewed in December 2015. Our submission aims to provide input to that review. REDRESS has worked with a number of expatriate women in the United Arab Emirates (UAE), some of whom have experienced discrimination and severe ill-treatment under the UAE legal system. Our submission to the 62nd Session of the Committee on the Elimination of Discrimination Against Women (CEDAW) addresses several areas of UAE’s domestic legal framework that are particularly inequitable for women, including domestic violence; divorce and child custody; equality before the law, including discrimination against women - in particular foreign women - with respect to access to justice and fair trial rights; and conditions of detention for women. REDRESS submitted written evidence to the House of Lords Select Committee on Sexual Violence in Conflict. The Committee is looking into the UK’s practice and policy concerning prevention of sexual violence in conflict. The submission emphasises victims' needs of holistic support services. It also calls for the investigation and prosecution of sexual violence in conflict at the national international levels, including abuses committed by peacekeeping troops. In 2014, REDRESS participated in the expert meetings at the Global Summit to End Sexual Violence in Conflict held in London and was also part of the expert group providing input into the International Protocol on the Documentation and Investigation of Sexual Violence in Conflict, which aims to support more effective investigations, prosecutions and justice for victims. REDRESS' submission to the Universal Periodic Review of Sudan focuses on developments since 2011, and the urgent need to carry out thorough reforms of Sudan’s legal and institutional framework and practice to ensure the effective prohibition of torture or other cruel, inhuman or degrading treatment or punishment. This submission is based on our extensive work on torture in the region, including representing and assisting individual survivors of torture in proceedings before national, regional and international bodies, and advocating for legislative and institutional reforms. 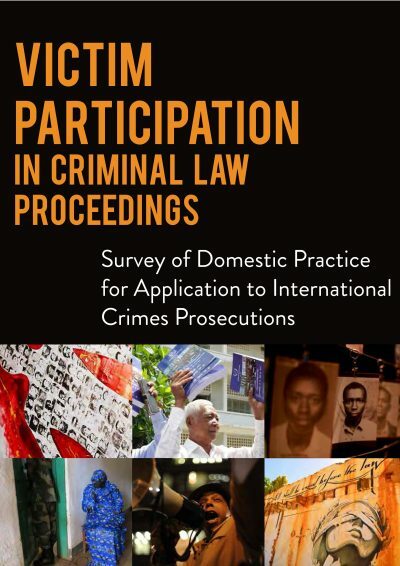 This report, authored in partnership with the Institute for Security Studies (ISS), provides a detailed study of domestic practice of victim participation in criminal law proceedings. It analyses victims’ rights to engage in criminal proceedings and in particular the extent to which a range of domestic jurisdictions provide victims with rights to play an active role. Such rights may include the right to launch proceedings, to challenge decisions not to prosecute, and to make statements in court. The aim of this report is to support the efforts of states to develop and put in place a framework for victim participation in the context of investigating and prosecuting international crimes. This report aims to be a useful reference for actors in domestic systems engaged in wider discussions on victims’ rights. Incorporated as a Not-for-Profit corporation in the State of New York (No. 13-4028661).